The world is not perfectly smooth to him. Mortal, pestilent mortal, the world sees him differently and he, too, with his lateral orientation towards the left perceives the world in the dissimilar way. A wind blows and his hand with abraded skin comes to aid for his afflicted right leg, he sits on a nearby rickety bench, physically no more a fighter, warrior, soldier, he accepts it; but he stands again as the spirit of fighting continues to live his very inside. He walks in the same stumbling manner for the past 40 yrs., but he walks and walks, his leg aches, sometimes his heart too, but he walks. The sun peeped out of the horizon, the birds have started chanting and singing; the haze is flaring out. He looks at the sun, he has always liked the red in the star, the red of the apples, sour and sweet just like his life. ”oh!! Reminiscences, come on…Come on, towards the orchid. “He again beholds the sun and the sun searches him. There is an appeal in his eyes and a relief in the sun’s warmth. The sun is no more peeping, but has risen in its whole apple shape above the horizon …people say that sun is round but many things can deliver their different perceptions, he has always conceived the sun as an apple, the curves of an apple and the flushed rosy shimmer on the concavity that had caught his eye. He walks again, with a bit more pace and bit more depth in his face. “Oh”… He spent too much time, looking at the sun, deciphering the implicitness in today’s sun, did he find an answer? He had reached the orchid, the apple boulevard. He walks on, sometimes throwing frivolous rebukes at the birds. The whole orchid ambience, redolent of apples is creating an ambiguous understanding for him and he too reacts affirmative. Apples and apples and apples … everywhere…An inexplicable bond exists between him and the apples. Every season, he is here to pluck the apples, making apple jelly, apple pie, apple pickle and apple life. He straightens the ladder and leans against one of the apple trees and climbs with a jute basket in his hand …. “Hey, grandad Lamey, Lamey …Grandad”. Children shouting outside his manor. 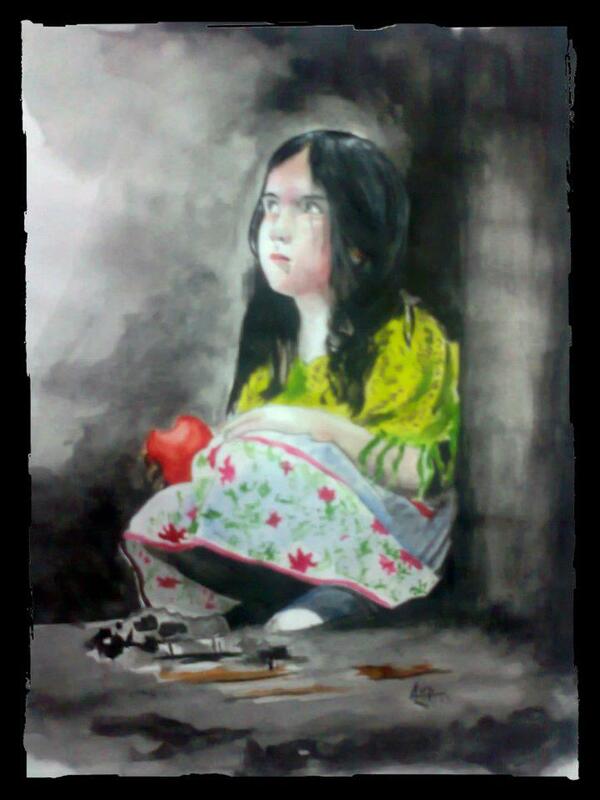 “Little apples…” He too had a child, sweet little apple perhaps and before that he himself was also a child…. “My little apple, shoo sweet, my dear baby “. His mother used to teach him about the different aspects of life about one’s orientation towards the good or bad in life, and one must be precluded from doing harm, sometimes he took his mother as bigoted, but his mother used to tell him ..”If, you do good things to yourself and other people, if you help the needy and renounce your love for them then when you leave this world you’ll reach a garden, a garden with blush green grass, lucid sky and lucent apples ….and then God himself will pluck an apple from his tree and give it to you and you’ll find profound peace. “The ladder creaks and he smiles …”but to eat apples from God you will have to be a good apple not a rotten one as one rotten apple can destroy the whole lot”. His mother used to say while caressing him. Perhaps Adolf Hitler seemed to have understood all the meaning of ‘his’ mother’s quoting as he scrutinized and dug deep. The jute basket is almost full, ah!! How he could miss this, here in the corner of the branch, a big round apple and he stretches his hand towards it…., Mary Blotcher, wife of him … sumptuous as he has always thought of her …ruined and desolated Germany as he thinks of then. Was his mother soothsayer???? Had she been knowing, what was coming forth, he knows not, not even know ….but now preceding now, he is a lieutenant in the German army, no no…. he must not conceal his sins, he was actually a lieutenant in Hitler’s army. He plucks the big apple and keeps in the basket but there is a patch in the apple… He was married to Mary Blotcher, who had no blue eyes, no brown hair and so no authentic soul. Is the apple rotten, he checks…..? His mother, yes she was bigoted, she opposed his marriage, and a war of worlds was happening, certain epidemics were spreading in the German ambience, each one being different to the other but inexplicably of the same origin. There was an optimism epidemic, there was an end epidemic and a start epidemic and there was a Jew epidemic and to compliment all these the war epidemic and Hitler meticulously spurred all these. A cold wind clashes with his leg and he shivers. Rotten apples were segregated and smothered. They smelled bad, had odd shapes, of course they had to be thrown away, but strangely their characteristics were discussed, displayed and demonstrated …., the ‘traders ‘ themselves seemed in dilemma deciphering the exact meaning of an apple being rotten or they themselves were defining new terms for an apple to be rotten. He raises his hand with the apple towards the sunlight, observing the patch…., he is blinded by the blaze ….he raises his hand in obeisance, “All hail Hitler” was he blinded that time too. “Truth will out” isn’t the way the saying goes? Truth when left to itself is truthful, all it needs is one’s encouragement. His wife too was doomed to be rotten, her smell was sniffed, no he must hide her, she must be concealed within, but for how much long .., they would take her, and then would remain only her smell, whether rotten or not. He is lieutenant in the army, how could an impeccable apple be with a dilapidated one…but he loved her. Today’s vespers had no prayers to him, there were allegations, questions, demise, grief…, today it was Mary’s Sabbath too. She was in her room, presumably had finished her prayers when he entered the room. He was not in a quest to discover her prayers but perhaps his own thoughts were not impervious. He wanted to behold her. He wanted to indulge in the atmosphere of room which was soothing but was continuously fermenting. Her hair tied in a knot, while gown for prayers, here sweet apple face, her eyes are not blue , her tied hair no blonde , there was no need to apprise, his wife feigned a smile, he too stretched his lips, caressed his wife…a tear trickles on both their faces , his hood winking beast has come out… ‘Marry..’ he has his rifle out and GUSH, GUSH…he bayonets his wife, blood sprinkling on his face and her scream deafening him, he bayonets his apple and perhaps the seed inside her. He is on a ladder…, with a short knife in his hands and he slices the patch with it, only to discover that the patch was the only halcyon thing on the apple. The incinerating sun, sending it’s rays and piercing him in the eyes, tears flowed, he had her in his arms, crying, his love, his life, his apple, was it rotten!!!. He had never before questioned the principles and ideologies of this diversity in Germany, He was always conscientious about talking out the new morals of the Hitler saviour, but why he laments todays, why does he cry out his throat over the carcass of his wife. The ladder creaks again. “Lamey is on for the apples again”. He utters something…like imploring the sun. The sun was not that trenchant to him now. Blindly in the worldly eyes, the inner eyes had started to blossom. But he would not let them take her. “I LOVE YOU, no no no” fumbled words came out of his mouth, he was shivering, trembling, drenched in tears and blood. He was shouting for his Mary. He lifted her body, took her downstairs into the ally and out of the house, in the backyard. He dug out a pit which was to be grave of the wife. He started kissing her, her whole body, wailing continuously. His rotten apple was to be decomposed. He does not know whether God will pluck his apple for him but he knows he has his apple back.